كما يمكن النسخ إلى الأقراص المدمجة بأي صيغة تريدها. وتستطيع ايضا إنشاء البومات صوتية منظمة ، كما انه يدعم تشغيل العديد من الصيغ والبرامج الخاصة بالصوت والفيديو . 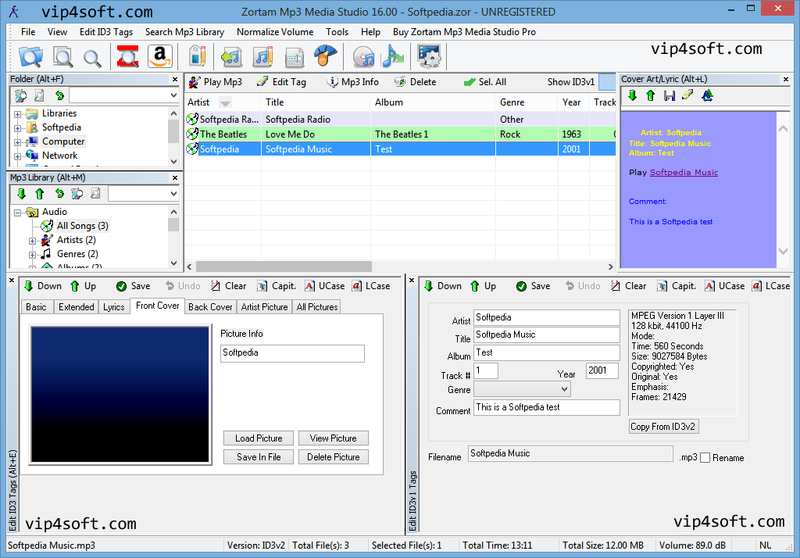 Zortam Mp3 Media Studio is all-in-one MP3 organizer application for converting audio CD to MP3 and WAV format (CD Ripper) using CDDB (Internet Compact Disc Database), editing ID3 tags (Mp3 ID3 Tag Editor) with support for ID3v1 and ID3v2 tags, converting Wav to Mp3 files and Mp3 to Wav files (Wav/Mp3 Converter), managing M3U playlists (Playlist manager), renaming files (Mp3 Renamer) using ID3 tags, searching for duplicate Mp3 files, searching and cataloguing Mp3 files into Mp3 library, listening Mp3’s using your favorite Mp3 player and much more. You can even add lyrics and picture to ID3 tags(cover, artist picture, etc.) to your Mp3 files. With Zortam Mp3 Media Studio editing ID3 tags is very easy and you may process as many files as you like. You can sort your Mp3 list in ascending or descending order using all ID3 tags and MPEG fields. You can drag & drop files to the playlist. Mp3 Media Studio is a great tool for creating Mp3’s, editing Mp3 Id3 tags and keeping your Mp3 files organized. Enjoy Zortam Mp3 Player visualizations which supports lyrics and cover arts directly from your Mp3’s. Lyrics visualization enables lyrics scrool and picture arts from MP3 tags and can be viewed as slideshow. Zortam Mp3 Player visualization supports custom jpg background pictures and integrated visualization.